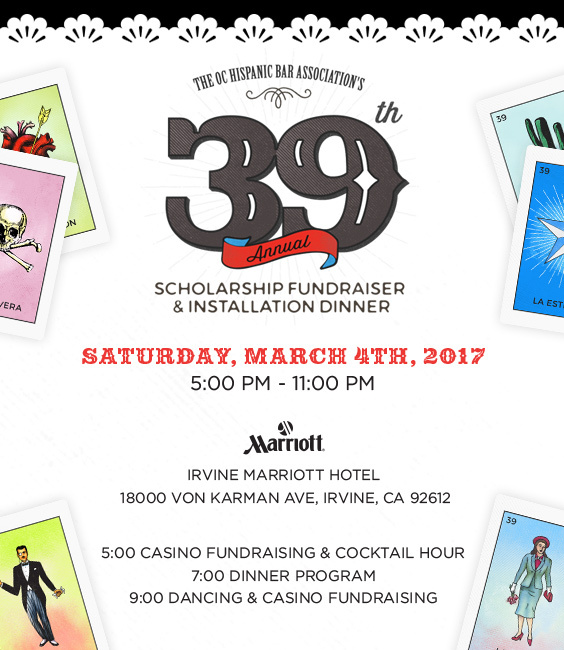 As President of the Hispanic Bar Association of Orange County (HBA), I am honored to invite you to our 39th Annual Gala Scholarship Fundraiser and Installation Dinner, on Saturday, March 4, 2017, at the Marriott in Irvine, California. This year’s event will commence with two-hours of casino-style gaming, an amazing dinner and program, followed by entertainment by La Sonora Dinamita for some dancing and additional gaming. This Gala will be the must-go-to event of the year. Last year’s dinner sold out, so be sure get your tickets early to avoid missing out on all the fun. recognition in the dinner program. Please contact me at (949) 383-5568 or via email at edominguez@hirson.com if you have any questions. Thank you in advance for your support. I look forward to seeing you at the Annual Dinner on March 4th.